Anyone can learn to fly. Learning to fly is one of the hardest things you’ll ever do. It is totally worth it. Being a pilot will give you a new outlook on life. You’ll be amazed at what radios do a 3000ft. Have you ever had an 3000-foot antenna tower? The world is glorious at 1000ft up. Share your enthusiasm with those around you. You have a perspective very few ever see, except for a few seconds on the way to 35,000ft. 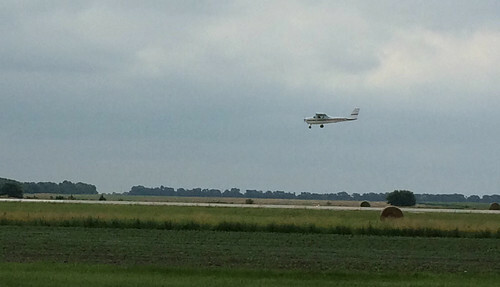 Earlier this month, I flew solo for the first time — the biggest milestone on the way to getting the pilot’s license. Here’s a photo my flight instructor took as I was coming in to land that day. Today I took my first flight to another airport. It wasn’t far — about 20 miles away — but it was still a thrill. I flew about 1500ft above the ground, roughly above a freeway that happened to be my route. From that height, things still look three-dimensional. The grain elevator that marked out the one small town, the manufacturing plant at another, the college at the third. Bales of hay dotting the fields, the occasional tractor creeping along a road, churches sticking up above the trees. These are places I’ve known for decades, and now, suddenly, they are all new. What a time to be alive! I am glad that our world is still so full of wonder and beauty. One of my favorites, indeed. Captures the poetry of it so welll.